One thing I do remember very clearly about using a typewriter is the fear of making a typing mistake. Erasing a wrong letter was quite a bother, so the trick was to focus and try to not make mistakes. In fact, for anything longer than a couple of sentences, the actual crafting of the text had to be done the old fashioned way, on a piece of paper. Then you’d use the machine to create a nicer version of the already existing script. A lot of silicon passed through silicon valley since then. We now have ultra-sophisticated word processors, allowing us to make changes on the fly, with a flick of the mouse. And it’s not just writing that was revolutionized. Using drawing software , digital painters can now press a button to “undo” a false ink stroke, which once would have been irreversible. They can completely change the colour palette after the painting is done. They can zoom in to the pixel level to achieve a level of perfection that would have been impossible to imagine 30 years ago. In animation, we now have motion graphs that allow animators a level of polish that was never even remotely possible with paper drawings; and with affordable digital printing right around the corner, sculpting is on the brink of a similar revolution. For the creative process to work well, your inner ‘concept persona’ needs to be playful and carefree. You shouldn’t be bothered by superficial imperfections or even actual mistakes. 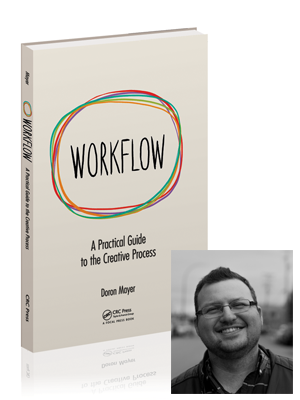 At this phase of the creative workflow, your state of mind should be a whirlwind of options and half-baked thoughts. The mere idea of fixing a spelling mistake or a brushstroke shouldn’t even cross your mind. This was easy to do in the old days. You would jot notes and ideas on a piece of paper, and you didn’t expect the note to look nice – it was too difficult and didn’t matter much. You would sketch tiny little thumbnail sketches with a ball pen, and you didn’t worry about the details because it was physically impossible to control the pen to that degree anyway. Not so today. Nothing is impossible and nothing is difficult. Everything in the digital world is easily undo-able, resize-able, zoom-in-able, copy-paste-able and changeable. And it lures you in. Editing tools can be great for the concept stage. They allow you to try many options quickly, which is very much in line with that playful mindset you need. But when you start using those tools in a way that slows down the flow of ideas in favor of fixing trivial mistakes, you are no longer doing the job you should be doing. Your Production persona just took over your Concept stage, and that’s a big no-no. Tip: If you’re not sure what I mean by the Concept and Production ‘personas’, have a look at this video about the four personas of the creative workflow. The easiest solution, of course, is to simply not allow yourself to fix small mistakes when you’re in the Concept stage. That, unfortunately, is easier said than done. It can be surprisingly hard to let an obvious mistake go when it’s so temptingly easy to fix it right here, right now. Need an example? I just fixed a spelling mistake in the word “obvious” in the last sentence – even though I was entirely aware that I should leave it and correct it later. It just bugged me and made it hard for me to concentrate, and in the end I gave in, went back, and fixed it. For me, and for many other creatives I have discussed this with, the answer is to stay away from the computer when in Concept mode. Different kinds of projects work well with different kinds of solutions, so I suggest you experiment with several “undigitized” Concept-building methods to figure out what works best for you. For visual ideas, I scribble ideas on physical paper. The larger the sheet, the better it works! I sometimes record my ideas. It’s digital, but it doesn’t allow any editing, so that’s fine. 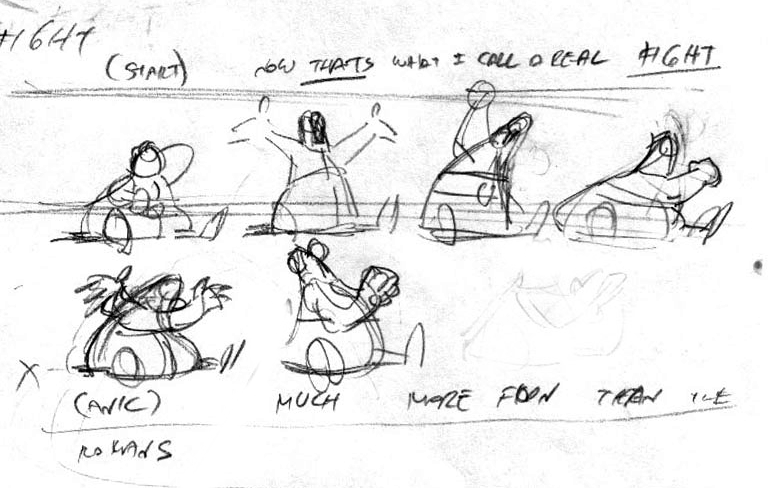 In animation, I like to repeatedly act out the scene, trying many options, sometimes filming myself doing it (see below). If you’re very used to working digitally, the first few times working old-school like that may feel a bit weird. Don’t be discouraged too quickly though – give it a proper chance! Help your Concept brain escape the lure of editing and the tyranny of self-evaluation, and give your ideas a chance to flow freely in their own weird way. Once you get used to it, I think you’ll find it worthwhile.